It’s hard to overstate what huge plans Toyota had for the its then-new Tundra pickup, circa 2007. 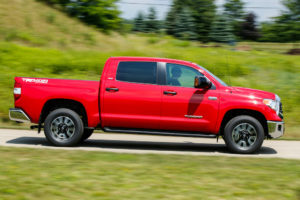 The company spent a fortune developing their jumbo-sized 2007 Tundra, talking to people who used trucks (though every truck manufacturer says they do that), shedding the “good but small” mantra of the first-generation Tundra and going with a truck that went toe-to-toe with the dominant American-brand pickups. Toyota even built an all-new factory for the Tundra in San Antonio, Texas, in the heart of truck country. Strong initial sales tapered off, and the Tundra remained an also-ran while GM, Ford, and Ram sold hundreds of thousands of pickups. Toyota reckons it’s time to fire another salvo in the pickup wars, so we spent a week with the refreshed 2014 Tundra to see how the truck stacks up against some tough competition. With the refreshed (not all-new) Tundra for 2014, Toyota has ditched the doughy, soft curves of the 2007-2013 model and replaced them with a “chiseled” look. The result is arguably a more attractive truck (though as they say, design taste is subjective), but it cuts a very similar silhouette compared to the old truck. That’s not a surprise considering the old and new Tundra share their hard points, including cab sheet metal. Aside from adding creases and angles to the truck’s design, Toyota’s California-based design team upped the ante in the Giant Truck Grille Race, holding its own against similarly cartoonish extra large, extra shiny grilles on Ford, Ram, and Chevrolet half ton pickups. With the Tundra’s grille now nearly overlapping its headlights, it’s clear that eventually pickup designers will run out of front-end real estate (as the Silverado’s designers did) and finally grilles may start to recede as aerodynamics and fuel efficiency rise in importance over the next few years. Oh yes, fuel efficiency. We won’t sugar coat here: the Tundra has terrible fuel economy. I remain shocked that the company that prides itself on its environmental leadership and in the fuel efficiency of its car lineup would struggle to field a full-size truck with competitive fuel consumption. Granted, part of the Tundra’s efficiency problem is that the 5.7 liter V8 is a strong engine that sounds great, and there is much temptation to dip your foot into the fun part of the throttle. Helped by burbling dual exhaust (which still exit out the sides of the truck, through chromed TRD-branded tips), you sound like you’re driving a sports car, if Toyota made big-bore V8 sports cars. 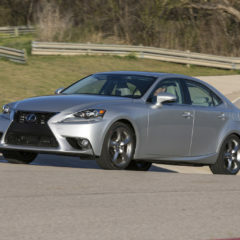 (Actually, Toyota did – they were called the Lexus IS-F – and they sounded great). But even on my absolute best behavior, I couldn’t top 18 MPG in the Tundra for a mostly highway trip. After a week and nearly 400 miles with the truck, my average settled on 13.6 MPG. Compared to a 5.3 liter V8-equipped GMC Sierra we drove a few weeks ago, the Tundra wasn’t even in the same ballpark as the GMC’s 17.3 MPG average. The EPA rates the Tundra 4×4 5.7 liter at 13 MPG city/17 MPG highway while GM’s 5.3 liter 4×4 is rated at 16/22. 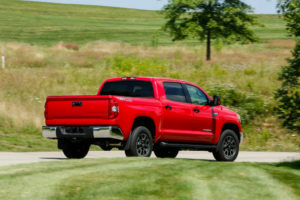 That’s a significant 20 percent better mileage than the Tundra offers, so we’re talking about real money flying out the TRD exhaust pipes in the Tundra if you choose that over a GMC or Chevrolet. According to the EPA, driving a Tundra will cost you $2,750 more in fuel costs over five years than driving a 5.3 liter Silverado. According to me, I was pretty unhappy that I had to drop $52 worth of regular unleaded into the Tundra’s gas tank after just 200 miles on the trip odometer. Part of the Tundra’s fuel economy deficit comes from the fact that its engine is larger and more power than GM’s 5.3 (395 horsepower vs. 355). However, the 2014 Ram has a 5.7 liter engine, and with Ram’s new 8-speed automatic, that truck is rated at 15 city/21 highway, easily topping the Tundra. GM’s larger 6.2 liter V8 available in higher trim levels beats the Tundra in economy and power, throwing down a 14/20 rating. 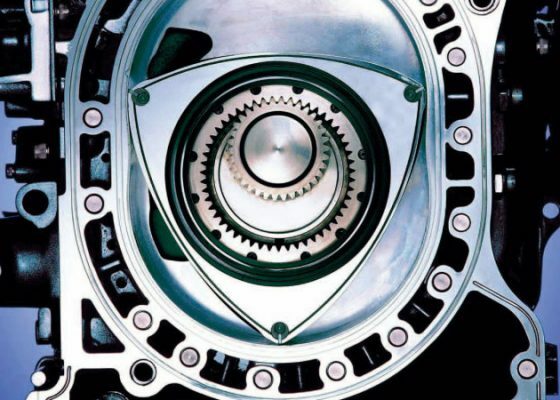 OK, so we hate the Tundra’s fuel economy. Though that’s a big one, there’s much more to a truck than how much fossil fuel it burns. Our tester was a CrewMax model, which means it gets the super-sized cab. Toyota also offers a regular cab and a Double Cab (the latter being more like a crew cab than an extended cab, even with front-hinged doors and a reasonable seat that even taller people can fit into for shorter trips). It’s a cliché, but rear-seat legroom in the CrewMax is limousine-like. When I have the driver’s seat adjusted for my 6’4″ 190 pound frame, I can jump into the back seat and cross my legs. The rear seat bottom folds up to create a large, mostly-flat covered storage area if you don’t need the back seat area for, you know, seating. 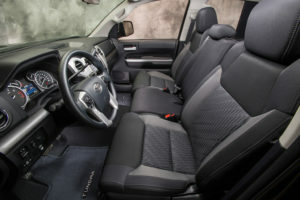 Toyota has completely revamped the interior in the 2014 Tundra, with improved electronics and a more squared-off, more symmetrical dashboard design. The previous Tundra had some interior issues with controls being hard to reach, only because the truck was so darn wide. This one has similar ones, with the radio in particular being high on the dash and fairly far from even a lanky driver’s easy reach without leaning forward to reach the tuning knob. Everything seemed to be screwed together well, but for a $48,000 pickup, I was disappointed by the quality of the materials. Ford, Ram, and GM all have far better interior materials, with GM in particular having dramatically upped their interior game for 2014. 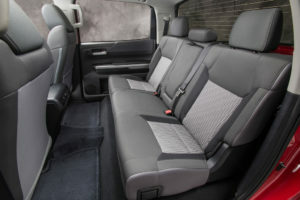 The Tundra SR5 tester, however, had cloth seats (which did feel durable), but armrest padding was minimal, and the entire dashboard as well as all four door panels were hard plastic. The Tundra did, however, have switchgear that was of obvious high quality. Buttons feel solid and well-made and the radio’s volume and tuning knobs in particular are made of metal and make it obvious that Toyota spent some extra dough getting those touch points right. The 2014 Tundra gets new in-cabin electronics, including a large full-color TFT display in the gauge cluster between the speedometer and tachometer and a new, larger navigation screen with a new version of Toyota’s Entune infotainment system. 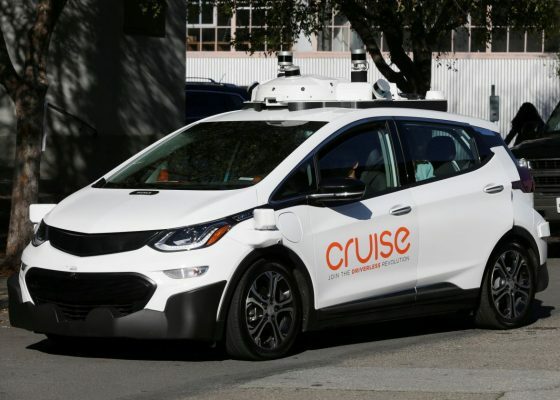 The trip computer, though it looks nice, has only a fraction of the functionality of the units in Ford and GM. For instance, there’s only one fuel economy average; Ford and GM both include fuel economy tied to both the trip odometer and a separate measure (such as since last fill, or since last start). Maybe Toyota doesn’t want drivers knowing the bad news about their truck’s fuel economy. Toyota’s Entune system is improved in the Tundra, though it’s still not the easiest to use (that title may well fall to the excellent GM MyLink system now that Ford has saddled the F-Series with MyFord Touch). Pairing my iPhone was easy and the system handled Bluetooth phone calls and music streaming without skipping a beat. There is Pandora integration, but I spent most of the week listening to podcasts using my iPhone’s podcast app and streaming them through the truck’s audio system, which worked very well. The audio system in the SR5 trim level is mediocre; a slightly less mediocre JBL system is available in higher trim levels for more money. In terms of using the Tundra as a truck, I didn’t really have an opportunity to put its 5.5 foot cargo box to use. I did note that, like the GM trucks, the tailgate was damped so it wouldn’t slam down if it slipped your grasp when opening it. The cargo light does a great job of illuminating at least the rear three quarters of the box, and our tester was equipped with a plastic bedliner. The aforementioned Sierra had a spray-in bedliner that would probably have better long-term durability without harming the truck bed’s actual finish. There are several models in the 2014 Tundra range, starting with the price-leader SR trim, followed by SR5 (which our tester represented, and which Toyota expects to comprise the majority of Tundra sales), Limited, Platinum, and 1794 Edition. Some of my interior criticisms of the SR5 (hard plastic, etc.) appear to be addressed by the much more expensive 1794 Edition, which features a wood steering wheel, leather inserts on the dash and door panels, and a name derived from the date of the founding of the ranch on which the Tundra’s San Antonio, Texas plant was built on top of. Pricing begins at $26,915 for the Tundra SR regular cab (SR is also available as a Double Cab; no other Tundra models are available with a regular cab). The SR5 ($30.890), Limited ($41,580), Platinum ($48,315), and 1794 Edition (also $48,315) are available in CrewMax, or, in the case of the SR5, as a Double Cab as well. Step up to a CrewMax SR5 and the price leaps to $36,375 and the 5.7 liter V8 and four wheel drive comes along for the ride. 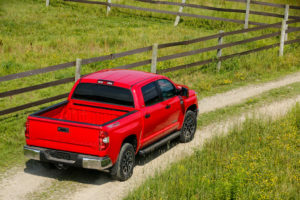 Tack on Entune Premium Audio with Navigation (a reasonable $585), Deck rail system in the bed ($125), TRD Off Road Package ($2,030; includes special TRD wheels, Bilstein shocks, rear side privacy glass, engine and fuel tank skid plates, and a decal), SR5 Upgrade Package ($1,015; replaces front bench seat with buckets and a console-mounted shift lever), Bedliner ($365), Chrome Tube Steps ($534- a must-have), Mini Tie Down w/Hook ($45), Alloy Wheel Locks ($81), Dual Exhaust ($1,100), and Carpet Floor Mats ($191). Add Destination ($995) and you get a final MSRP of $43,445. 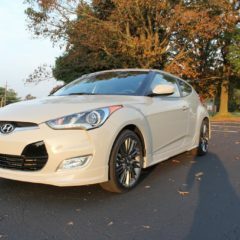 Unfortunately, our pals at TrueDelta.com do not have pickup trucks in their pricing tool, so we have to go by feel. The price feels about right for what you’re getting, though I tend to prefer leather seats regardless of the vehicle. 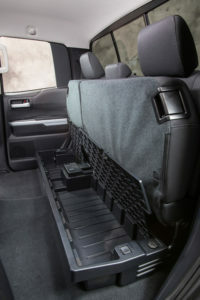 It appears, according to the configurator on Toyota.com, that you can’t get leather in the SR5, so no go there. By way of comparison, the GMC Sierra that I keep talking about had an MSRP of almost exactly $50,000. The GMC had lane departure warning, a heated steering wheel, leather seats, Z71 off road package, and collision warning/prevention, so it’s hard to compare between the two trucks. Is the Tundra a good truck? Definitely. Is it the best truck available? I don’t think it’s really the best at anything that it does, at least from my perspective. It’s not the fastest, not the most efficient, not the best interior, not the best looking, not the least expensive. It’s a truck built on a spec sheet – big wheelbase, big width, big engine, big interior, big cargo/towing numbers – but the sum of the parts just does not equal a the best truck that you can get. Add all that to the fact that domestic brand have far more configurations available – and it’s easy to see why the Tundra has not been the strongest seller in a very competitive segment. If you decide to buy a Tundra, you’re not picking a bad truck. Just not the best one. Toyota provided the vehicle, insurance, and a tank of gas for this review.